Ever since I went to Compare Foods, a local Hispanic grocery store, all I can think about are chilies and making tacos and bowls. Luckily, it’s almost Cinco de Mayo, so I’m going to be giving you plenty of fun new recipes to celebrate with! Today, I have two delicious recipes for you to try in your Instant Pot. 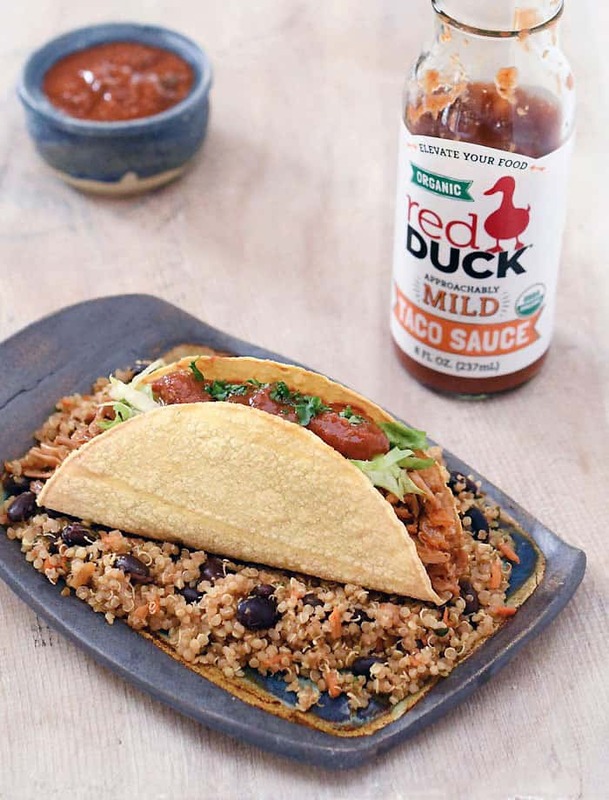 If you don’t have an Instant Pot yet, you can try my slow cooker lentil quinoa taco recipe. It’s hands off, too! This post is sponsored by I Heart Quinoa, which is a company I really love and have used for years. One of the things I love most is that their toasted quinoa doesn’t need to be rinsed and is ready to go when you are. 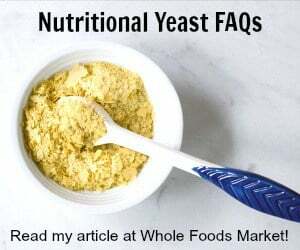 You can find it in your local Whole Foods, Kroger’s, or get it online at Amazon. I love the mouthfeel of quinoa in tacos and as a bowl base. In fact, I served this with the Chile Citrus Jackfruit on top with avocado, lettuce, and tomatoes. 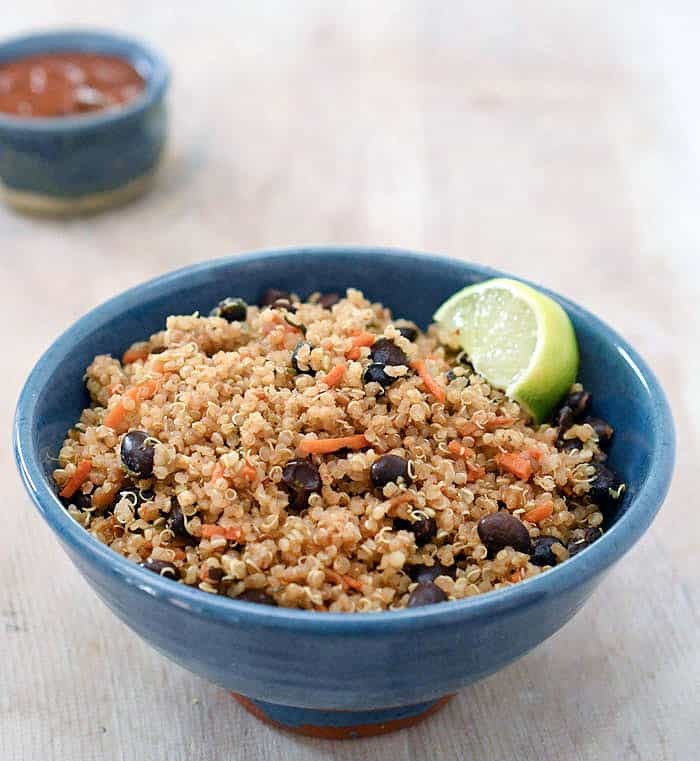 But the Quinoa Black Bean mix with zucchini and carrot is a natural fit for a taco. 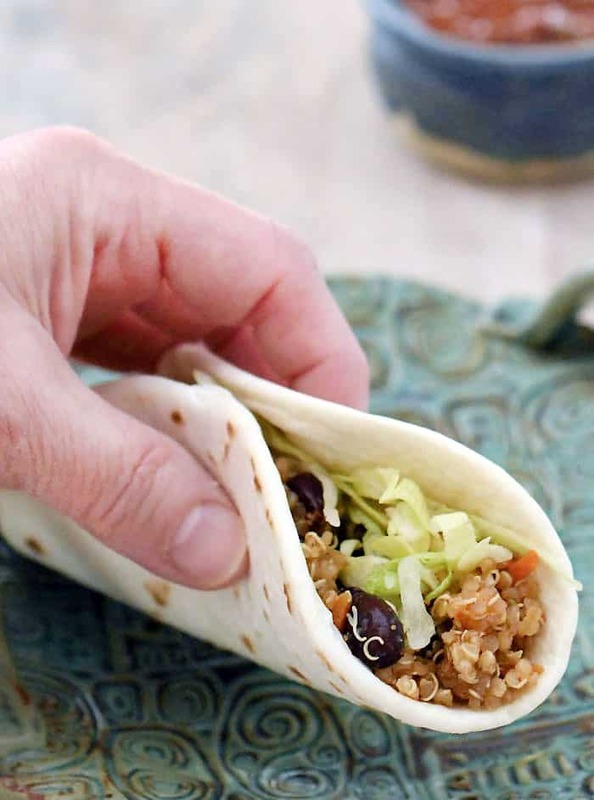 If you’d rather make one in the slow cooker try my crockpot lentil quinoa taco filling. Perfect dish for a easy lunch or dinner! Add the zucchini, carrots, and corn kernels to your Instant Pot liner. Saute until most of the liquid is out of the shredded zucchini, then add the chili powder, cumin, and chile powder. Saute for another minute until the spices become fragrant. 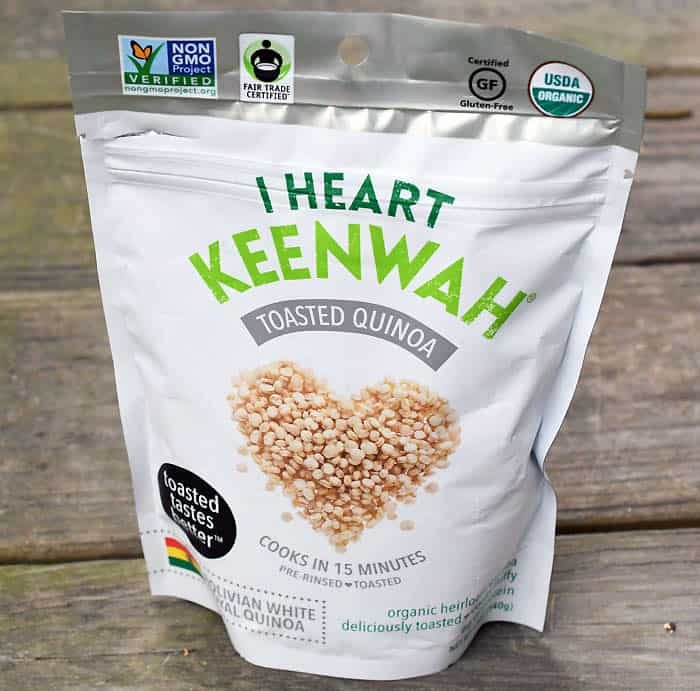 Turn the Instant Pot off, then add the Mexican oregano, black beans, I Heart Keenwah Toasted Quinoa, water or broth. Press the manual or pressure cook button and set it to cook on high pressure for 6 minutes. Carefully release the pressure manually. Serve in soft or crunchy taco shells, burritos, or as a base for your new favorite bowl! I’ve really been having fun making jackfruit recipes lately. There will be a few coming up in The Revised Vegan Slow Cooker, due to be released at the end of this year, so you can put that on your holiday wish list! 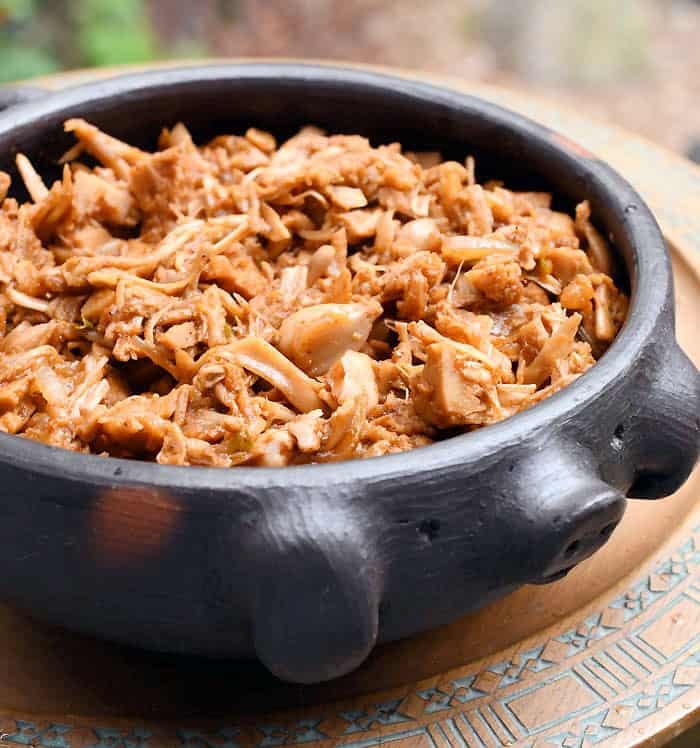 Today we’re using jackfruit to make a meaty taco filling that’s bursting with citrus flavors and chile pepper powders. You can get the recipe on my new site, Plant Based Instant Pot, by clicking here. If you’re wanting to try a few other recipes with jackfruit, try my jackfruit bbq stuffed rolls or Trial and Eater’s bbq pulled jackfruit. « A Vegan Slow Cooker Menu Plan that Will Change Your Cooking Forever! Hey Kathy the instructions for the Jackfruit bowls are not visible. Could you resend the recipe? Looks delish!!! Thanks! It looks like they are there now. Thank you for the wonderful recipe can’t wait to give it a try. Can you substitute chilli powder with just regular chili powder?